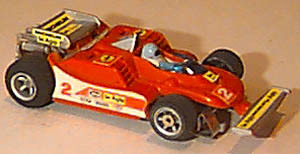 The Ferrari has no number molded in the one piece body. There is a separate cockpit tinted windshield. The rear low wing is a separate piece. There are a total of 8 separate stickers on the car. This came on either a G-Plus chassis (1740) or this speed shifter chassis. There is also a very rare version with clear windshield.